Armed with many years of experience, Wagemann develops appliances all over the world for supply and waste disposal, interior cleaning (IRA) and media holders. The appliances are consistently designed to be modular, can be fully automated and remote monitoring can be added. Our solutions enable both fixed and mobile use. Draught circulation plans, storage areas, toilet technology, air-conditioning requirements and the attendant places where they will be installed are all taken into account according to their specific challenges. 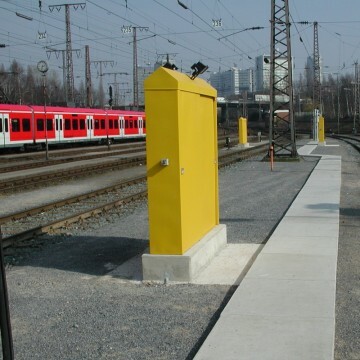 Compliance with the relevant stipulations of the German Railways Authority and the equivalent national and international regulatory bodies is a matter of course. 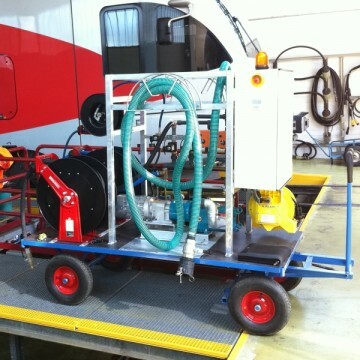 Can be mounted on conventional carrier vehicles and trailers. A wide range of drive types available, also with “super quiet” generators. Waste water tanks in a range of different sizes, with optional activated carbon filter. Simple emptying of the GFK tank with the aid of rotation reversal. Fork-lift compatible thanks to practical forklift pockets.